This is Commodore 64 code and memory debugger that works in real time. It is quick prototyping tool where you can play with Commodore 64 machine and its internals. 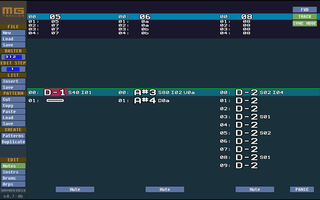 The MG Tracker is a music editor that utilises Matt Gray's Commodore 64 Dominator replayer from Matt Gray C64 Reformation compo.